Hello everyone. My name is Bob and I am a US Soldier stationed in Germany. My son was born over here in May 2006. 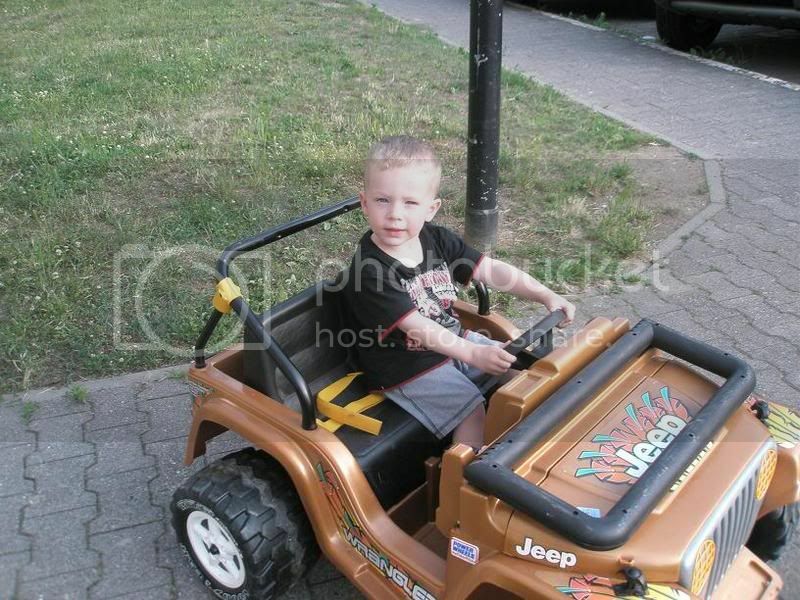 He loves cars and I have been passively looking for a Power Wheel for him. Well, a neighbor had an extra one that he sold me for $20. It did not come with a charger, although I am borrowing one. It is a bit beat up and needs some TLC cosmetically. I am not familiar with all of the different models and such, but it is a Jeep Wrangler, orange in color, with ugly stickers all over it. I charged the battery overnight and it does not work. I looked around and everything seems to be mechanically intact. I do work with electronics in the Army, so I am not a complete noob in that aspect. I would like to get this thing up and running. I have plans to remove all stickers, sand it down, paint it black, and clean it up overall. My father and I have a graphics business on the side, so I am going to put some pretty cool decals on it also. It is looking like I am going to need a new battery/charger at least, but since the entire thing only cost $20, I am still feeling like I got a good deal! I am not looking for a speedster or anything crazy, just something that looks cool that my son can cruise on. Does anyone have any tips/advice for getting this thing on the road? I will post up some pictures once I take them. By the way, www.sweetgfx.com is my website. Once I customize my son's I can offer up some stuff to you guys. Did you test the battery with a volt meter? NOTICE: I am not on MPW as much as I used to be!! PM me if you have questions about any of my threads!!! I especially would love a PM from you if you did a project of your own similar to one of mine!!! I am not going to buy anything from Europe, I will moving back to the states in August. I do want to get it up and running before everything is picked up in early August. I am going to head to the local toy store to see what they have. I have not tested the battery, but I do not have experience with batteries this large, so what exactly am I looking for? to see if it is actually putting out the 12 volts? Here are a few pictures for reference! I just messaged Gruber, or whoever they are called, which was recommended through the forum. I told them I need a battery and charger and asked which combo they recommended. I went outside to test it up, put the back end on a chair, and held down the peddle. Both wheels turn equally speed wise, but they are both slow, even when I took out the screw for the faster speed. I am pretty sure the battery is burned out and will not hold enough of a charge to power it properly. Check out that thread that Bonner linked to, it should be helpeful. That'll easily tell you if the battery you have is good or not. FAQ - Which charger should I use? There's a boat load more info in the FAQ's that you should find helpful. Take a browse through it and see what you think. Then if you have any more questions, give us a shout. after a little reading, I am actually considering buying 3 6v batteries and once of the nice chargers. It is seriously as simple as hooking the batteries up in series? Then you have 18v of power? Yep, that's it. It's quite easy to make them faster. The problem is resisting the temptation to go further yet, endagering your motors and gearboxes and children and parked cars! 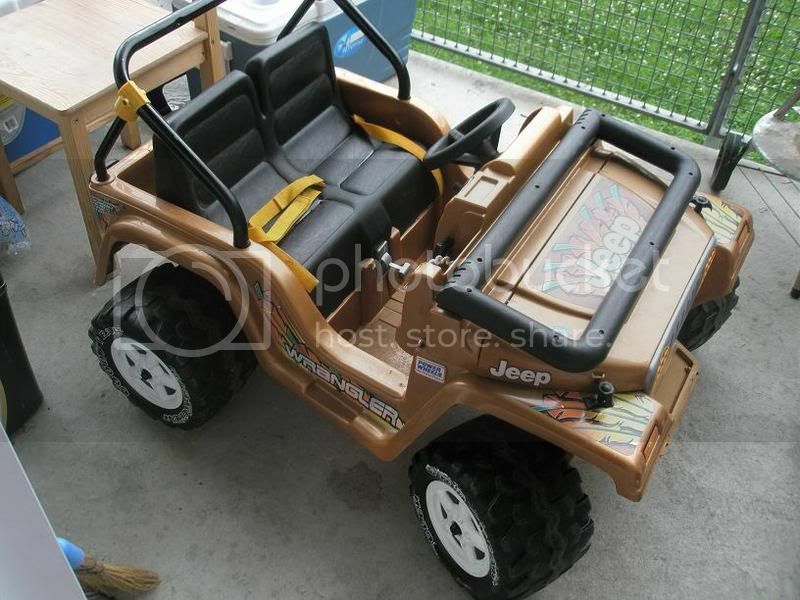 Oh, I forgot to mention, that's a Copper Jeep, look it up on Hobbymasters and you'll find a complete parts list for it. I actually thought they weren't too bad looking, some of the models get pretty busy with all the bright colored accessories (like our Limited Edition Jeep!). I am still trying to figure out which 3 6volt batteries i want to buy...there are so many choices. beyond that, i do not know which 12v i want to buy, if i go that route. it seems like the gruber one is the best choice. i think the thing is FUGLY! maybe it is because the jeep is faded, the stickers are not shiny, and it needs some uplifting. removing the stickers, sanding down the body, painting it black, few coats of clear, and then reassembly should look great. i am also going to fix some saggy areas and cut off the stupid tray looking thing in the front. This might help you make a decision on battery choices. [/quote] i am also going to fix some saggy areas and cut off the stupid tray looking thing in the front. You might not want to "cut off the stupid tray looking thing in the front." It helps hold the grille up. What you need is the brush guard. I actually liked the copper color myself, but if you've got ideas and the wherewithall go for it. Be mindfull that when you go 3x six volts in series for driving, the connections then have to be reconnected for charging purposes to a parallel setup. I didn't think it'd be a big deal, but getting comfortable connectors for the wife to handle became a bigger project then making it work. I just shipped the PW off on Tuesday this week, so I will not see it for probably another couple of months. I will be SOMEWHERE in PA, so once I get settled, I will start by purchasing one good 12v battery, getting him used to it, and going from there. I'm just across the Walt Whitman bridge from Philly. There is the beginnings of a group for PA here. Drop by, say hello, subscrive to the thread... then we'll try a get-together someday.